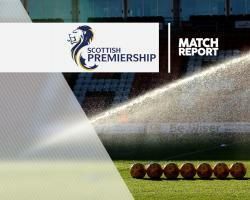 Substitute Chris Burke's injury-time goal gave Ross County a point against Partick Thistle in a late late show at Firhill. Midfielder Sean Welsh scored from the spot in the 24th minute and the home side looked on course for their first Ladbrokes Premiership win since the opening day of the season. However, in the fifth of nine added minutes for an injury to Jags defender Liam Lindsay, Burke, on for Marcus Fraser just after the hour mark, fired in a from 14 yards to make it 1-1, with the home side hanging on in the final moments. The match ended in some excitement, but the early stages offered little in terms of opportunities at either end. Lindsay, playing in a new back-three formation with Danny Devine and Adam Barton, headed over from a Welsh free-kick after 12 minutes. At the other end Devine blocked a shot from County attacker Craig Curran after Barton had been robbed by Alex Schalk out wide. Welsh's penalty came from his corner from the right which fell for Thistle striker Kris Doolan, who was then adjudged by referee Don Robertson to have been bundled over by returning midfielder Ryan Dow. The former Hibernian player slammed his penalty high past ex-Jags goalkeeper Scott Fox for his third goal of the season. County stepped up a gear and the Maryhill men had some defending to do while taking advantage of the extra space on the counter. The last chance of half came when Barton fizzed a right-footed shot from 30 yards just over the bar with three minutes remaining. More was expected of the lacklustre visitors after the break and, in the 56th minute, Curran hit a post with a side-footed shot before Thistle keeper Ryan Scully ended the brief spell of pressure by saving Dow's header. Greg Morrison and Burke came on for Schalk and Fraser respectively as boss Jim McIntyre looked for another avenue back into the game. There was some concern around the 70-minute mark when Lindsay was left prostrate with what appeared to be a head knock after being involved in an aerial challenge with Staggies defender Andrew Davies and his own keeper Scully. After a lengthy spell of treatment, the Jags defender was carried off the pitch on a stretcher, replaced by Ziggy Gordon. Duting the added time Burke went to ground in the box under a challenge from Partick attacker Ade Azeez, but Robertson ignored the penalty claim. However, County were not to be denied. Burke raced into the Thistle box and drilled a shot low past Scully, who the had to make a fine close-range save from Dow to save the point.